Best-selling "faction" (mix of fact & fiction) author Brad Thor got into a heated discussion with the hosts of local Chicago morning show "Windy City Live" yesterday. The heat came while discussing the offer Brad made via Twitter to buy George Zimmerman a new gun. Obama's willing accomplice and race-baiting "chief law enforcement officer" Attorney General Eric Holder has placed a hold on all evidence from the Zimmerman trial. The evidence from the trial includes George Zimmerman's gun which he used to defend his own life while sustaining an "MMA-style ground and pound" beating from Trayvon Martin. I'm happy to NOT be one of those Americans who willingly associates with people who believe that government control is a good thing. I have no trust in government...nor do I trust those who do. I wonder when the government will decide to restore the 2nd Amendment rights of the citizens of Chicago? 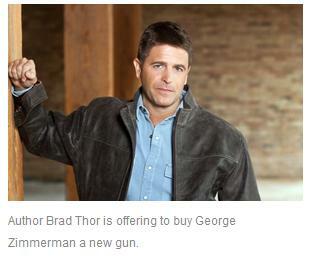 See Brad Thor's entire 7-minute interview HERE. To view Brad's tweets on the subject and for more background information see THIS STORY on The Blaze.